The following pages are a chronicle of the restoration of White River Lumber Company(WRLCo) caboose #001. This project started in the Spring of 2002. At that time, it was determined that something must be done to the caboose or it would not be around much longer. The elements had been most unkind and it showed. Preliminary inspections showed that the frame was seriously rot damaged and the siding was in bad shape. The restoration of the caboose became a priority. Work was begun while the caboose was still in the museum's collection storage area. This work consisted of a number of important projects: cleaning out the accumilated debris from the inside; blocking up the body to take the lean out; chaining and blocking one truck, which was broken, so the car could be safely moved; and starting the process of labeling every frame member and major component. 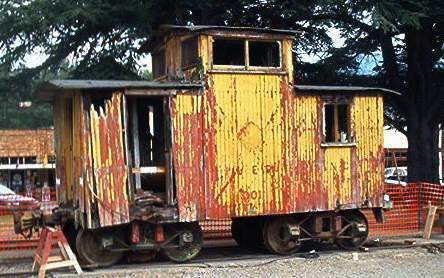 In early August of 2002, the caboose was moved from storage to the Snoqualmie depot for restoration. A work area was created at the depot to facilitate restoration. Work continued to label the frame members. Detailed drawings and measurements were made. Many long conversations were held and a restoration plan was devised. Research was begun by project manager Rich Wilkens. His research cleared up many misconceptions about the caboose. A better understanding of what we wished to achieve was also a result of his research. Dismantling began in August, 2002. The siding was removed to expose the body frame work. Often, what looked good from the inside was rotted or damaged on the out side. Most of the frame members were saved and put into storage. As much of the original frame will be restored to it's original place. Some of the longer pieces that are too far gone will be used to replace some of the shorter pieces that need replacing. Some of the siding and flooring was saved to use as patterns, but most was disposed of, too far gone to be of any use. The frame was stripped down to the center sill. Work shifted to indoor projects at that time, as winter weather had set in. Over the winter, work was done on restoring two trucks for use under the caboose. Two wood arch-bar trucks of Northern Pacific heritage were picked to do the honors. These trucks are the same type that were used under the #002. The truck frames were completed in early February, 2003. Some truck components had to be fabricated, such as the spring seats and center plates. The bolsters were not completed until June of 2003. Work shifted back to the frame. The old center sill was carefully raken apart and set aside, upside down in the work area. It was referenced many times during the reconstruction of the new center sill. The weather made work on the center sill a hit-or-miss proposition, but progress was made. The photo story on these pages starts with the rebuilding of the center sill and follows along as each step is completed. Regular updates will be made as time and project progress allow. This front page is still under construction. I will add more information and photos as they become available. White River Lumber #001 was built in 1945 by the WRLCo shop forces. It was built using a shortened log car style frame. Body bolsters(heavily modified) and trucks from a Milwaukee Road car were used. A simple body using typical house framing techinques was added. Two types of siding were used to sheath the exterior; there is no interior wall covering. The caboose was originally painted a mineral brown color, with white lettering and no number. In the late 1940s the caboose was painted red with black trim and lettering. This soon changed to white trim and lettering. In 1949 Weyerhauser took over the mill and the caboose was given the number 001. A sister caboose, which became the #002, was actually built the year prior to the #001. At this time the name changed to Weyerhauser Timber White River Branch. Log train operations ended and the caboose was used on the short run to the interchange. In 1952, Fairbanks-Morse H12-44 #1 arrived, wearing bright yellow paint. Shortly there after, the #001 was repainted yellow. At about the same time, the cupola was rebuilt with double pane side windows and the electrical wiring was redone. Interior lighting was added and windshield wipers added to the cupola windows. The #001 spent the next 10+ years in regular service with #1. Sometime In the mid 1960s, the trucks and brake rigging were removed and the #001 was set on the ground as a shed. Steel screens were bolted over the windows to keep unwanted visitors out. The A-end railing was cut up, allowing easier entry. It sat for many years until it was donated to the Northwest Railway Museum. When the #001 arrived, The process of decay had already begun. The roof was largely gone. The end platforms were only partially intact. Temporary measures were taken to protect the caboose from the weather. Trucks from the museums collection were used as the originals were long gone. #001 had joined the ranks of the museum's collection, awaiting it's turn for restoration.